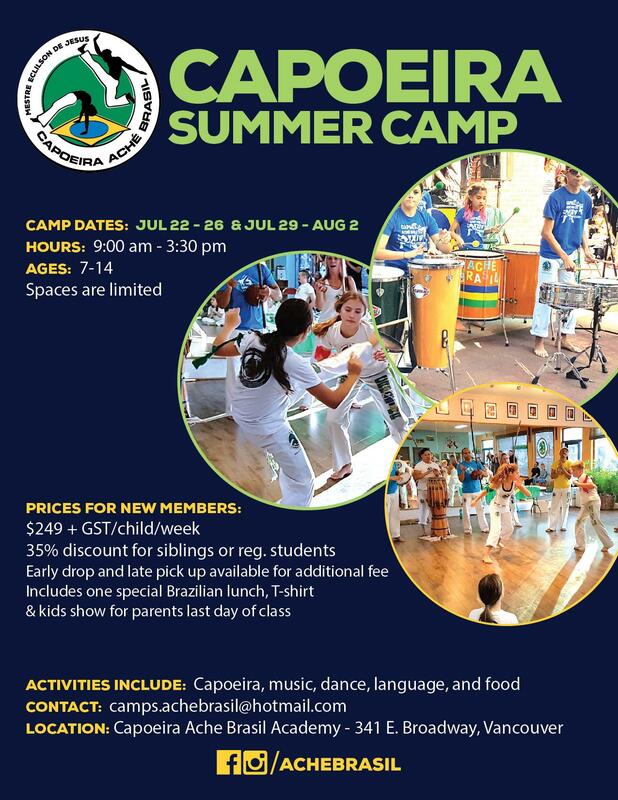 Our Capoeira Summer Day Camp for 2019 dates are: July 22 - 26 and July 29 - Aug 2. Enjoy a Brazilian cultural experience for a fraction of the cost of actually going to Brazil. We have a full week of fun, excitement, & enrichment in store for your child. Learn Capoeira, Brasil’s unique and powerful martial art. In Capoeira Ache Brasil’s safe and positive environment, we will also explore dance, music, language, history and the cuisine of Brazil. There is also an optional opportunity for campers to demonstrate their skills to friends and family at the last day of camp. Fees: $249 plus GST for the first child. For the second child or one of our members we offer a 35% discount. We accept E-transfer, Cash, Visa, Mastercard or Debit card. We accept E-transfers, Cash, Debit, Mastercard, or Visa.